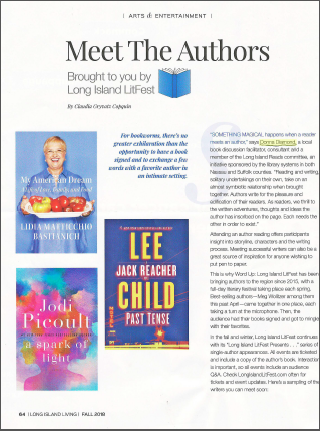 Books'NMe.com - Looking for great Book Clubs in Suffolk Cnty on Long Island, NY? I am an avid book lover, a true bibliophile, and have been for most of my life. It has been a joy and an honor for me to facilitate book clubs on Long Island for more than twenty years. I currently lead three monthly book discussion groups at Elwood, Harborfields and Northport Libraries, (formerly at Barnes & Noble for more than ten years). I am also an original and very proud member of the Long Island Reads Committee, The One Island-One Book Concept which encourages all of Nassau and Suffolk Counties to read the same book during National Library Week in April of each year. 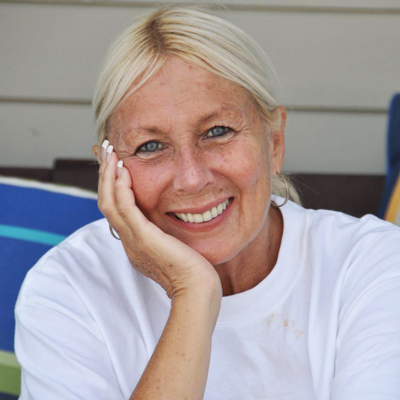 “SOMETHING MAGICAL happens when a reader meets an author, says Donna Diamond, a local book discussion facilitator, consultant and a member of the Long Island Reads committee, an initiative sponsored by the library systems in both Nassau and Suffolk counties. "Reading and writing, solitary undertakings on their own, take on an almost symbiotic relationship when brought together. Authors write for the pleasure and edification of their readers. As readers, we thrill to the written adventures, thoughts and ideas the author has inscribed on the page. Each needs the other in order to exist." Attending an author reading offers participants insight into storyline, characters and the writing process. Meeting successful writers can also be a great source of inspiration for anyone wishing to put pen to paper. Donna Diamond hosts book club discussions all over Suffolk County on Long Island, NY. This list is updated regularly and listed in order of our next discussion at the top. Thank you for visiting Books 'N Me and we hope to see you at a meeting.